Thursday - 9 a.m. - 3 p.m. The Town of Wheelock is located in northwestern Caledonia County and bordered by the town of Sheffield to the north, Sutton to the northeast, Lyndon to the east, Danville to the south, Stannard to the southwest, and Greensboro to the west. It was Chartered in June 14, 1785. Its Area is 25,613 Acres which is 40.02 Square Miles. The Town's Coordinates (Geographic Center) is N 44° 35' W 72°05' and Altitude is 790 feet ASL. The highest point in the town is Wheelock Mountain, with an elevation of 2,782 feet. Wheelock has an interesting and involved history. In 1774 it was patented by New York as part of a much larger tract named Bamf to a group of Scots who planned to divide the whole tract into two towns, Bamf and Sterling, after their old homes in Scotland. The Revolution intervened, preventing them from taking up their patent, and after the war the same group of men petitioned Vermont to charter the tract to them. Before their petition was acted upon, Vermont chartered part of their tract as the new town of Wheelock under very unusual circumstances. The charter was issued to John Wheelock and the trustees of Dartmouth College and Moor's Charity School as being "of important service in diffusing useful literature among mankind and thro' this state in particular." The town had been applied for during the lifetime of Dartmouth's founder, the Reverend Eleazar Wheelock, the father of John Wheelock and second president of the college. A short time before the charter was issued, it was strongly suggested that the town be named Santa Maria. John Wheelock had just married Maria Suhm (a daughter of Governor Christian Suhm of the Caribbean island of St. Thomas), and he very much wanted her name commemorated in the Vermont town's name. However, the legislators must have felt that it sounded either too foreign or too popish for their state, and they elected to name the town for both the father and the son. 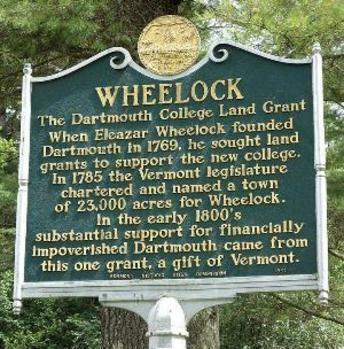 Wheelock is thus the only town in Vermont ever to have been chartered to an organization wholly outside of the state. As late as the mid-l800's the rentals paid by Wheelock tenants continued to provide a large percentage of the permanent funds for Dartmouth College, and some lands in the town are still held under long-term rentals from the college. As if all that wasn't enough, in 1828, Dartmouth President Nathan Lord was in Wheelock collecting rents, and was heard to invite any young man of Wheelock who wanted to go to college to come down to Dartmouth, where they would get free tuition. Fifty years passed before anyone actually took him up on his invitation. The program is pretty simple: the student must be a full-time resident of Wheelock at the time application is made to Dartmouth (and, of course, be academically qualified and accepted). When Dartmouth went co-ed, so did the Wheelock Scholar program. So far, the only female recipient of the scholarship was of the Class of 1988. In total, only eight students from Wheelock have taken advantage of Lord's offer. Wheelock has a current Dartmouth Scholar, Noah Manning, who will graduate this spring 2017. Very early in the town's settlement a village grew up at what became known as Ramsay (sometimes Ramsey) Corners. Located almost in the geographic center of town, the little settlement in the early 1800's had a store, several businesses and two hotels. It is said that the proprietors of the Ramsay Hotel owned 1,000 acres of land and at one time ran as many as 6,000 sheep. One of the hotel owners, Bob Ramsay, was a fiddler of considerable talent, in great demand for every party held within miles. For many years it was a tradition to cut a tall tamarack tree in the Ramsay Corners neighborhood for the town's Fourth of July "Liberty pole." Town of Wheelock has been added to your trip.